We offer training courses to teach your office how to stay out of legal hot water from our own experience. We’ve seen workplace issues go to court, and we’ve seen them resolved internally. We can train your managers to understand the legal framework and increase their own confidence, while also protecting you from legal worries down the road. Designed to help managers and employees understand the law of harassment and what they can do to protect themselves. A detailed discussion of the federal and Colorado laws that new companies need to understand to stay compliant. Employee or Independent Contractor – How do You Decide? Learn the distinctions between employees and independent contractors, and why it should matter to you. Designed to fulfill the training requirement of the DOT regulations for drug and alcohol testing of employees. This course is customizable for FMCSA, FTA or PMSHA regulations. Prepare your managers with tools to help them to effectively manage employee performance and avoid common mistakes. Learn how to conduct legally defensible workplace investigations. 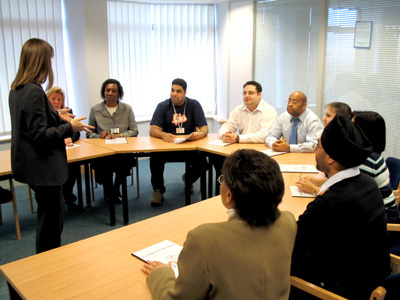 We also offer customized training courses on any employment or labor law topic that your business needs. "Julie was engaged to conduct our Company's annual HR compliance training sessions for managers and employees. Julie went above and beyond to ensure that our training was delivered effectively both onsite and in our remote operation. Julie was very courteous and professional at all times. Her extensive legal compliance background allowed her to provide practical and applicable examples during the training sessions. I highly recommend Julie and Employment Compliance Solutions to any organization seeking HR compliance advice or training support." "Aurora Fire Rescue (AFR) recently conducted a search for a firm to provide workplace conduct training for all members of the organization related to diversity, discrimination, inclusiveness and Equal Employment Opportunity Commission (EEOC) implications. The training needed to address appropriate behavior in the workplace accounting for social, cultural and environmental complexities associated with the fire service. AFR selected Employment Compliance Solutions LLC, which is owned and operated by Julie Pate. Ms. Pate delivered exceptional training to all AFR members providing awareness, education, and ethical implications/perspectives related to appropriate workplace behavior. The results of the department wide initiative yielded positive outcomes for our organization. Ms. Pate’s approach and engaging delivery method provided members of the organization an opportunity to ask tough questions in a welcoming environment. Julie is knowledgeable in the fire industry and applied that conceptual framework facilitating highly effective and appropriate deliverables. I would highly recommend the workplace conduct training described to any public or private entity, which desires to clearly communicate and foster a positive working environment for all employees."